Carpe Carp: Seize the Fish! Fifteen questions relating to Alpacas! An “alpaca wall hanging” is one of the clues that can lead you to Lima, Peru in the original version of this edutainment software (full title required). This Twilight Saga actor (also known for previously dating another celebrity with whom he shares a first name) has been accused of having an alpaca doppleganger. Patricia Marx attempted to use an alpaca as an emotional support animal as part of her research for an article in this Conde Nast magazine. This Oscar-winning actress, who had a top ten hit in much of Europe with a duet with Robbie Williams, apparently raises alpacas at a Nashville farm. This flower, also the name of an Oprah book club pick and its subsequent Michelle Pfeffer film adaptation, is poisonous to alpacas. Alpacas’ fiber lacks what wax secreted by sheep and other wool-bearing animals, used in lip balms and to soften baseball gloves? 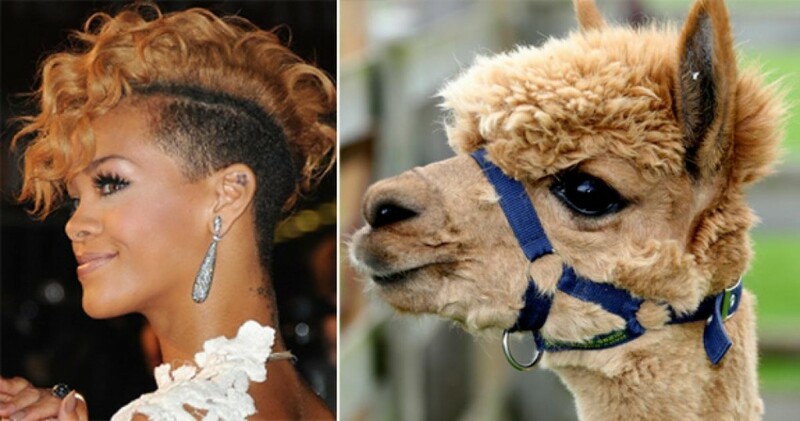 Identify the singer shown here alongside her (purported) alpaca doppleganger. Tony Hsieh, CEO of this company, keeps an alpaca as a pet.